Wherever you are in the world you can bring the M&S Company Archive into your classroom. Book a time-travelling live video conference link-up with M&S founder Michael Marks in 1904, or his son Simon Marks – the Retail Revolutionary in the 1960s. You can also take a trip through our history with M&S Time Travellers, identifying mystery objects from the Archive and learning more about what they can tell us about life in the past. Linking to History, English and IT, these workshops offer an exciting and innovative way to bring the past to life, and offer a great opportunity to explore enquiry questions and analyse a range of sources. All the workshops are free and are 45 minutes long. We're working in partnership with Yorkshire Video Conferencing, which means that when you book you’ll be given access to pre- and post-workshop activity ideas and a wealth of online resources. For more information and details of how to book please contact us or visit our booking page on the Yorkshire Video Conferencing website here. · Meet Michael Marks: hear how a young man from Belarus brought a new way of shopping to the people of Yorkshire. 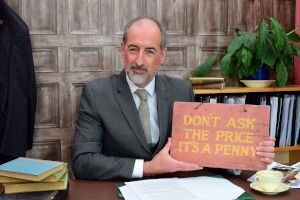 · Meet Simon Marks: how did Michael’s son steer M&S through two world wars and turn it into the company that we all know today? 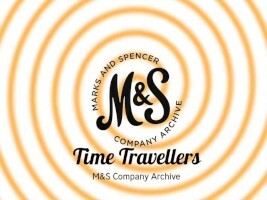 · M&S Time Travellers: become history detectives and travel through over 130 years of M&S history, discovering our mystery objects on the way!